While the general principles of asset tracing in India are set out in the trusts law, civil procedure and criminal law, the Indian courts have yet to substantively address these issues. The absence of precedent and jurisprudence is surprising given India's robust, if dilatory, judiciary and the circumstances that inform India's dismal ranking on the transparency index. While Indian law recognises the supervening claim of a bona fide purchaser for value without notice, the conflicting demands of a claimant who has suffered fraud against the rights of such a bona fide purchaser have yet to be decided by Indian courts. As set out in this chapter, the elements required for Indian courts to develop the jurisprudence for asset tracing already exist in Indian law, and this will arguably develop as efforts to increase transparency succeed. Interestingly, in India this may well develop at the criminal law level and not as a result of civil actions. Tracing is the most sought remedy in respect of fraud under civil law. Recourse is generally available under contract law, company law and tort and trust law. conversion is an act of wilful interference with movable property without lawful justification in a manner that is inconsistent with the right of another, thereby depriving the other of the use and possession of the movable. Those who abet a tortious act have equal liability to those who commit the wrong. A person procuring a wrongful act from another is liable if he or she knowingly induces that wrongful act. All persons who aid, abet, direct or join in committing a wrongful act are joint tortfeasors who are liable jointly and severally to the injured party. The principal remedy for a tort is an action for damages. In certain cases, an injunction restraining any dealing in or with the property obtained by fraud may also be obtained in addition to damages. Another remedy that may be available is specific restitution of property. The principal legislation governing contracts in India is the Indian Contract Act 1872 (Contract Act). Section 19 of the Contract Act allows a party to nullify a contract in cases where consent to the contract by a person was caused by coercion, fraud or misrepresentation.3 Any such person may also insist that the contract be performed and that he or she be put in the position in which he or she would have been if the representations made had been true. In addition to claiming rescission of the contract on account of fraud (where the rescinding party is liable to restore any benefit received under a contract that is voidable),5 a claimant may also bring a civil suit for damages. As a general rule, damages are calculated based on the position that a plaintiff would have been in had the representation been true, as opposed to the position he or she is in owing to the fraud.6 A claim for effective restitution would likely necessitate an action to trace a specific asset. Section 447 of the Companies Act defines fraud to include an act or omission with the intent to deceive or gain an advantage over, or to cause injury to, a company, its shareholders or its creditors, regardless of whether or not there is in fact any wrongful gain or wrongful loss. Section 448 of the Companies Act additionally provides that any false statements made in, inter alia, the financial statements, prospectus and reports of a company will be treated as a fraud against the company. Penalties for fraud in terms of the Companies Act include imprisonment and fine. Interestingly, the Companies Act also allows for a company or any of its members, creditors or contributories to complain about the wrongful possession of any of the company's property by an officer or employee.7 While not strictly tracing, we believe that this is likely to provide the basis for a tracing action should facts permit an aggrieved party to seek this remedy. At Indian law, for every offence committed by a company or its officers, the company and the officer in default are held liable, as far as the Companies Act is concerned, making the directors and the management of the company vicariously liable for the acts of the company subject to their involvement in the conduct of its business. The Indian Trusts Act 1882 allows beneficiaries of a trust to bring an action against trustees for a 'breach of trust', essentially being a breach of the trustees' duties towards the beneficiary.10 This would include improper acts such as fraud on part of the trustees of an express trust or a constructive trust. If trust property reaches the hands of a third party inconsistently with the trust's aims, the beneficiary may institute a suit for a declaration that the property is comprised in the trust.11 Where a trustee has disposed of the trust property and the money or other property received can be traced into his or her hands, or the hands of his or her legal representative or legatee, the beneficiary has the same rights as he or she would to the original trust property. The Sale of Goods Act12 and the Transfer of Property Act13 protect a buyer who, in good faith and without notice of defect in title, purchases an asset without notice of the vendor's defect in title to that asset. While these protections are circumscribed by the stipulations of the relevant statute, they should provide a defence to a tracing action where the asset concerned has been alienated by the counterparty to the impugned contract. The Penal Code is the principal legislation describing criminal offences, and it recognises acts of criminal conspiracy, criminal misappropriation of property, criminal breach of trust, cheating, dishonest or fraudulent removal or concealment of property, and forgery as offences. The act of deceiving a person, fraudulently or dishonestly and thereby inducing him or her to deliver any property to any person, consent that the property be retained by any person, or commit an act or omission that causes or is likely to cause damage to the property, is punishable under the Penal Code as an offence of 'cheating'. Dishonest misappropriation or conversion of property by a person entrusted with that property constitutes an offence of 'criminal breach of trust'. In sum, the act of fraud forms an essential component of several offences and the offender is liable to be proceeded against and convicted in accordance with the procedural laws prescribed in this respect. Receipt22 and retention23 of stolen property are offences under the Penal Code. Habitual receiving and selling of stolen property and the act of assistance in the concealment of stolen property are recognised as separate offences under the Penal Code. The Code of Criminal Procedure 1973 (the Code of Criminal Procedure) prescribes the period of limitation for cognisance of offences.36 However, limitation is prescribed only for those offences punishable with imprisonment of up to three years and irrespective of this bar, courts may take cognisance of an offence after the expiry of the limitation period in the interests of justice. Efforts to secure assets may be taken pending the outcome of a claim and the procedures will vary depending on whether the claim is civil or criminal in nature. At any stage of a dispute, if a court is satisfied that the defendant is about to dispose of or remove the whole or part of the property from the jurisdiction of the court with the intent to obstruct or delay the execution of any decree that may be passed against the defendant, the court may order the defendant to furnish security or to show cause as to why he or she does not need to furnish security. If the defendant fails to do as ordered, the court may order the specified property to be attached. The attachment will, however, not affect any rights of third parties against the attached property that have accrued prior to the attachment; and not bar any person holding a decree against the defendant from applying for a sale of the attached property in execution of the decree. Indian courts have viewed granting an order for attachment as a drastic and extraordinary measure to be used sparingly and strictly in accordance with the Code of Civil Procedure when the court is satisfied that the plaintiff has a prima facie case and the defendant is about dispose of his or her property. confer rights in relation to the property on the receiver. if the party making the application comes to court with unclean hands. Additionally, the court must exercise sound and judicial discretion and must take into consideration all the circumstances of the case as may be required to provide justice. Criminal proceedings may be more efficacious, as courts and the police have broader powers with respect to seizure of property under the Code of Criminal Procedure. The courts are, inter alia, authorised to issue summons for the production of any documents or information as may be considered necessary for an investigation or inquiry,39 and to issue search warrants,40 including to any place outside India with which the Indian government has made arrangements.41 A police officer may be authorised by a magistrate to, inter alia, enter and search any place and take into possession any property that is reasonably suspected to be stolen,42 or seize43 any property that he or she, on his or her own accord, suspects to be stolen or that creates suspicion of an offence. In civil proceedings, the plaintiff may apply to the court to issue summons requiring a witness to be present in court, or the court may suo moto summon for the same reason any person who, after the issuance of the summons, is under a duty to be present and give evidence, or produce any document in his or her possession or power, as may be directed by the court. Where a party to a suit refuses to give evidence when required, the court may pronounce judgment against that party or make any order it deems fit. In criminal proceedings, courts have the power to summon any person as a witness and examine them, or to examine any person in attendance,44 and to recall or re-examine any person at any stage of a proceeding. The Reserve Bank of India regulates the banking sector in India and promulgated the Master Direction on Frauds dated 1 July 2016 (the Master Direction) to address, inter alia, frauds related to cheques and loans. The Master Direction requires banks and financial institutions to frame policies for fraud risk management and investigation, and to report any discovered frauds. Any matter in which a criminal process has been initiated otherwise than by the police must be treated as a fraud. The Master Direction was further amended to provide for an online, searchable central fraud registry based on instances of reported fraud. The registry is currently accessible only by banks. The Reserve Bank of India has also released regulations limiting customer liability in unauthorised or fraudulent electronic banking transactions.47 These regulations require banks to provide mechanisms for reporting unauthorised electronic transactions and limit customer liability if the customer informs the bank of the unauthorised transaction within a specified number of days. The Prevention of Money Laundering Act 2002 stipulates, inter alia, that the 'proceeds of crime' including any property obtained or increased in value, directly or indirectly, as a result of criminal activity related to a scheduled offence under the Act, may be seized and forfeited. Where property is taken or held outside India, 'proceeds of crime' also include property equivalent in value held within India. India has reciprocal arrangements with contracting states to deal with cases of money laundering. An order of discharge operates against liabilities, save for those incurred as a consequence of fraud or as means of any fraud. A fraud by the debtor is grounds for refusal of absolute discharge. In 2009, a division bench of the Supreme Court of India had held that an issue of fraud requires adducing and elaborate examination of evidence, and is therefore beyond the competency of an arbitrator.52 However, in 2014,53 a single judge of the Supreme Court of India held in favour of the arbitrability of fraud while noting that allegations of fraud to void an arbitration contract for delaying or avoiding reference to arbitration have become routine. fraud is alleged against the arbitration provision itself or the parent contract. While there are no specific rules in relation to fraud claims, Indian courts generally respect an express choice of the parties in relation to the law governing the contract provided that the choice is 'bona fide and legal'.57 The law chosen must relate to the subject matter of the contract or the parties in some manner, and must not be designed to overcome some specific prohibitions prescribed in the laws of the jurisdictions in which the parties reside or to which the transaction in some manner relates. Consequently, where the fraud arises out of a contract with an express choice-of-law provision, sufficient nexus needs to be established for an Indian court to honour the provision. In criminal proceedings, the Code of Criminal Procedure and the Fugitive Economic Offenders Ordinance (the Ordinance) provide enabling provisions to secure the arrest of persons and the seizure of property with respect to contracting states with which India has arrangements. If a court in India receives a warrant of arrest issued by a court in a contracting state for any person requiring him or her to attend or produce any document or thing, it may execute the warrant as if it were issued within India. Where the government receives a letter from a contracting state requesting attachment of property in India resulting from the commission of an offence in that state, the government may forward the letter to an Indian court, which may authorise the tracing of the property. If the property is believed to be concealed or disposed of by the police officer conducting the search, the property may be seized. Further, as a result of the investigation and after hearing the affected person, if it is established that the properties are the proceeds of a crime, the court may forfeit the properties in favour of the government. In civil proceedings, Rules 18 to 22 of Order XXVI of the Code of Civil Procedure allow a high court to issue a commission for examination of a witness situated in India upon a request made by a foreign court to obtain the evidence of that witness in any proceeding before it. The Indian government has, over the past few years, taken several measures to curb the use of 'black money', namely money held outside the formal economic system. In 2015, the Black Money (Undisclosed Foreign Income and Assets) and Imposition of Tax Act 2015 was notified to address the issue of undisclosed income and assets held outside India by Indian residents. In 2016, the Income Declaration Scheme was declared, which permitted taxpayers to disclose previously undisclosed domestic income and assets subject to payment of tax, a surcharge and a penalty with respect to the income and assets disclosed. 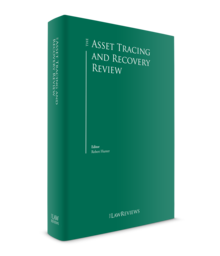 Asset tracing is currently neither an effective nor efficient remedy in India. According to the Reserve Bank of India's Financial Stability Report dated 26 June 2018, the monetary value of frauds in 2017–2018 increased to more than 300 billion rupees, with public sector banks accounting for about 85 per cent of this total. However, there have been recent instances of attaching the wrongdoer's assets, such as the 'Punjab National Bank Scam', involving more than US$2 billion and allegedly driven by the diamond dealer Nirav Modi, and Mehul Choksi, the prime accused. Based on a report filed by the Central Bureau of Investigation, the Enforcement Directorate registered a money laundering case against the accused for cheating Punjab National Bank into issuing fraudulent letters of understanding in connivance with certain bank officials, without complying with the procedural requirements, causing immense financial loss to the bank. The Enforcement Directorate is in the process of attaching the accused's assets for allegedly engineering the scam. However, the accused absconded in February 2018, well before the news broke in India, and are purportedly in the United Kingdom, continuously changing locations. The Indian government is currently seeking the extradition of the accused. Given the increasing number of financial frauds and instances of offenders fleeing India to evade the process of law, the Ordinance was promulgated on 21 April 2018. The Ordinance essentially empowers the investigating agency (i.e., the Enforcement Directorate) to attach the properties of the fugitive economic offender that are proceeds of crime in India and abroad prior to convicting the offender for the scheduled offence and paying off the lenders by selling off the confiscated properties. It is essential that tracing develops and is recognised as an appropriate remedy in Indian law. At this time, it is unclear whether the lead will be taken by the courts of civil law or the courts addressing criminal matters, but we hope that there will be significant progress on these matters in the near future. Arguably, in the absence of effective asset tracing, the government's stated objective of improving transparency will remain, in large measure, unfulfilled. 1 Justin Bharucha and Sonam Gupta are partners at Bharucha & Partners. 2 Bradford Building Society v. Borders, 1941 2 All ER 2015. 3 Section 17 of the Contract Act defines fraud as the suggestion, as a fact, of that which is not true, by one who does not believe it to be true; the active concealment of a fact by one having knowledge or belief of the fact; a promise made without any intention of performing it; and any other act fitted to deceive, or any such act or omission as the law specially declares to be fraudulent. However, it is also clarified that failure to disclose a fact will not constitute fraud, unless circumstances show that an individual had a duty to speak, or that silence would amount to speech. This would be the case, for example, where parties stand in a fiduciary relationship to one another. 4 Section 17 of the Contract Act. 5 Section 64 of the Contract Act. 6 The Indian Contract and Specific Relief Acts, Pollock and Mulla, 13th edition. 7 Section 452 of the Companies Act. 8 Section 271 of the Companies Act. 9 The SFIO is charged to investigate cases characterised by complexity and having interdepartmental and multidisciplinary ramifications; and substantial involvement of public interest to be judged by size, either in terms of monetary misappropriation or in terms of persons affected and the possibility of investigation leading to or contributing towards a clear improvement in systems, laws and procedures. 10 Section 3 of the Indian Trusts Act 1882. 11 Section 63 of the Indian Trusts Act 1882. 12 Which applies to property not being immovable property subject to the Transfer of Property Act. 13 Which applies to immovable property. 14 Section 23 of the Indian Trusts Act 1882. 15 Sections 3 and 5 of the Limitation Act 1963. 16 Section 17 of the Limitation Act 1963. 17 Section 22 of the Limitation Act 1963. 18 Section 25 of the Penal Code. 19 The Indian Penal Code, Ratanlal and Dhirajlal, 32nd edition, p. 106. 20 Dhunum Kazee, 1882 9 Cal 53, 60. 21 Section 410 of the Penal Code. 22 Section 411 of the Penal Code. 23 Section 412 of the Penal Code. 24 Section 105C(1) of the Code of Criminal Procedure read with Section 105D(1) of the Code of Criminal Procedure. 25 Section 91 of the Code of Criminal Procedure. 26 Section 105H(3) of the Code of Criminal Procedure. 27 Section 105H(2) of the Code of Criminal Procedure. 28 Section 105I(1) of the Code of Criminal Procedure. 29 Section 105I(2) of the Code of Criminal Procedure. 30 Section 109 of the Penal Code. 31 Section 108A of the Penal Code. 32 Section 154 of the Code of Criminal Procedure. 34 Section 151 of the Code of Criminal Procedure. 35 Section 154 of the Code of Criminal Procedure. 36 Sections 467–468 of the Code of Criminal Procedure. 37 Section 60 and Order XXXVIII of the Code of Civil Procedure. 38 Order XL of the Code of Civil Procedure. 39 Section 91 of the Code of Criminal Procedure. 40 Section 93 of the Code of Criminal Procedure. 41 Section 105 of the Code of Criminal Procedure. 42 Section 94 of the Code of Criminal Procedure. 43 Section 102 of the Code of Criminal Procedure. 44 Section 311 of the Code of Criminal Procedure. 45 Section 160 of the Code of Criminal Procedure. 46 Section 161 of the Code of Criminal Procedure. 47 Reserve Bank of India Circular on Customer Protection – Limiting Liability of Customers in Unauthorised Electronic Banking Transactions, dated 6 July 2017. 48 Section 58 of the Negotiable Instruments Act 1881. 49 The bona fide purchaser would also be protected in respect of property discussed earlier. 50 In December 2016, the Ministry of Corporate Affairs started notifying the Insolvency and Bankruptcy Code 2016 in tranches. Part III of the Insolvency Code governing individuals is yet to be notified. 51 Sections 66 and 73 of the Insolvency Code. 52 N Radhakrishnan v. Maestro Engineers & Ors, 2009 (13) SCALE 403. 53 Swiss Timing Limited v. Organising Committee, Commonwealth Games 2010, AIR 2014 SC 3723. 54 A. Ayyasamy v. A. Paramasivam & Ors, AIR 2016 SC 4675. 55 Section 92 of the Indian Evidence Act 1872. 56 Section 126 of the Indian Evidence Act 1872. 57 British India Steam Navigation Co Ltd. v. Shanmughavilas Cashew Industries and Ors (1990) 3 SCC 481. 58 Illustratively, the United Kingdom, Aden, Fiji, Singapore, Malaya, Trinidad and Tobago, New Zealand, the Cook Islands (including Niue) and the Trust Territories of Western Samoa, Hong Kong, Papua and New Guinea, Bangladesh and the United Arab Emirates. 59 Section 44 of the Code of Civil Procedure. 60 Formosa Plastic Corporation Ltd v. Ashok Chauhan & Ors 76 (1998) DLT 817. 61 Section 13 of the Code of Civil Procedure. 62 Maganbhai Chottubhai Patel v. Maniben, AIR 1985 Guj 187. 63 Sankaran Govindan v. Lakshmi Bharathi, AIR 1974 SC 1764. 64 Reserve Bank of India Circular on Discontinuance of Letters of Undertaking (LoUs) and Letters of Comfort (LoCs) for Trade Credits dated 13 March 2018.